The NSSN sends solidarity to the binworkers who were on strike in 2017 and are being forced to take action again. Unite, the UK and Ireland’s largest union, has announced that over 300 refuse workers employed by Birmingham council will begin two days of strike action a week, starting Tuesday 19 February, in an escalation of the ongoing industrial dispute. The two days a week of strike action, will be in addition to the overtime ban and the work to rule which the workers have been undertaking since Saturday 29 December 2018. The dispute concerns the blacklisting of workers who took strike action to save their jobs in 2017. It was subsequently discovered that the council had made secret payments to refuse workers who did not support that strike action. The dispute is a result of Unite attempting to ensure that all employees doing the same job are treated equally and are not discriminated against because of their choice of union or because they have taken lawful industrial action. Following detailed negotiations at the conciliation service Acas, Unite had set the council a deadline of the afternoon of Friday 1 February to make an improved offer to the workforce. The deadline was put in place as it has also emerged the council was further blacklisting the workers by refusing their holiday requests. However, the deadline passed with the council failing to make an improved offer to the workers. 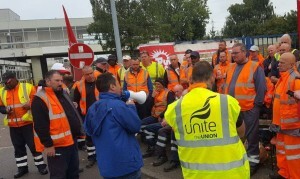 Unite is also aware that the council is in breach of the agreement to settle the 2017 dispute by employing agency crews to try to undermine the ongoing lawful industrial action. Unite assistant general secretary Howard Beckett said: “The decision to escalate the dispute and begin strike action is a direct result of Birmingham council’s failure to treat our members fairly. “Rather than settle this dispute and end the discrimination the council has instead chosen to try to utilise anti-trade union laws and is penalising workers who have been taking industrial action by denying them their holiday requests. 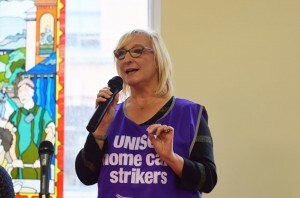 “Unite’s members have taken the decision to move to full strike action as a last resort due to the council’s refusal to make a fair offer to resolve this dispute. Isle of Man Post Office strike – Further to LTB 701/18, I can advise Branches that CWU Members in the Isle of Man will be taking a further three days of Industrial Action commencing at 05:30hrs Thursday 14th February and concluding at 18:00hrs Saturday 16th February. Colleagues will be aware that negotiations continued with the IOM Post Office until Thursday 13th December 2018 with further exchanges of correspondence taking place within the intervening period. I reported to the Union’s Postal Executive on Wednesday 30th January 2019 that over the Christmas break the CWU submitted a detailed response to the IOM’s proposal to effectively close the current DB Scheme to new members, introduce two-tier workforce and reduce the current USO from six to five days. The aim of this submission is to hopefully raise the bar and develop a genuine vision of the IOM Post Office along with repositioning the talks so an agreement can be achieved for IOM members that would reduce any long-term attacks on our members’ employment, standard of living and pension security. To date, the IOM Post Office has shown no desire to move away in any meaningful sense from what is effectively a race to the bottom mentality that seems endemic throughout the current IOM Post Office administration. In order for colleagues to have a better understanding of the attack taking place on our members in the Isle of Man, attached to this LTB is a copy of a notice that was featured in local newspapers during the Christmas period which has been successful in keeping the dispute in the public’s eye. I know that Branches will once again be keen to show their support for our colleagues in the IOM via messages in social media etc. Financial assistance would of course also be welcome and we are aware that some Branches have already sent donations to CWU Headquarters. Branches wishing to make donations to the strike fund should send cheques to the SDGS Department at CWU Headquarters made payable to the CWU General Fund along with any supporting correspondence clearly stating that it is for the IOM strike fund. I can confirm that following the Union issuing the three day Industrial Action notice, further meetings will now be taking place with the IOM Post Office week commencing Monday 4th February 2019. Branches will be advised of developments in due course. I would like to express my appreciation as well as that of the Postal Executive, CWU Officers of the IOM Branch and members for the messages of support and solidarity received. Any enquiries in relation to the content of this LTB should be addressed to the DGS(P) Department and further updates will be issued in due course. At 15:30 on Wednesday 13 February BEIS outsourced workers will walkout on strike in their second day of strike action fighting for the London Living Wage and an end to the scandal of outsourcing. We will be handing out strike themed cakes in return for donations to the strikers fund. There will be singing and dancing and guest speakers. Thursday 14 February, 08:00am – 10:00am: We again will have picket lines outside BEIS and we will be saying “Where is the love for your support staff Greg Clark?”. Love songs will rain supreme on the picket lines so come and join us, members of the Labour front bench, trade unionists and activists as we croon out a broken hearted love ballad. BREAKING: The date for the sentencing hearing has now been set to WEDNESDAY 6th FEBRUARY. JOIN US at 8:30am outside the court to demonstrate our continued solidarity with the #Stansted15 defendants, and to demand an end to the Government’s brutal policy of deportation charter flights, inhumane detention centres, and the Hostile Environment. ← NSSN 423: Support the Ireland Nurses and Midwives strike!